the old Irish Catholics under Pope’s Nuncios, under Abba O’Teage of the excommunications, and Owen Roe O’Neil, demanding not religious freedom only but what we now call Repeal of the Union, and unable to agree with the Catholics of the English Pale. the Ormonde Royalists of the Episcopalian and mixed creeds, strong for King without Covenant. The Great Rebellion of 1641-52 was a disaster for Ireland – for all of the main protagonists. By the end of the war, the Gaelic lords had lost most of their lands, their titles, their estates and their followers – those who were not killed in the war, were given the option – forced transportation west of the Shannon to Connacht as landless beggars, or forced transportation to the West Indies as slaves. The so-called ‘Old English’ lords – both Catholic and Anglican varieties – loyal to the deposed king also lost their lands but at least they had the option of following the new king (exiled to France) and serving him there. In all, almost 75% of Ireland was given to Cromwell’s officers, soldiers and followers in payment for their services. This was not a good time for the Church of Ireland (or Anglicans in England), as the Puritans saw them as Royalists and Royalists were on the losing side in the English Civil War. In addition, almost 25% of the civilian population had died as a result of famine and related diseases following the ‘slash and burn’ tactics of the various military campaigns – the new settlers entered an erie landscape, in need of a fresh start and new ideas. The Irish Rebellion of 1641 began as an attempted coup d’état by Irish Catholic gentry, who tried to seize control of the English administration in Ireland to force concessions for the Catholics living under English rule. This coup failed and the rebellion quickly developed into an sectarian conflict between native Irish Catholics on one side, and Old English + new Scottish Protestant settlers on the other. This began a conflict known as the Irish Confederate Wars. The rising was sparked by Catholic fears of an impending invasion of Ireland by anti-Catholic forces of the English Long Parliament and the Scottish Covenanters, who were defying the authority of King Charles I (king of England, Scotland, and Ireland). In 1638 to 1640 Scotland rose in a revolt known as the Bishops’ Wars against Charles I’s attempt to impose Church of England prayers there, believing them to be too close to Catholicism. The King’s attempts to put down the rebellion failed when the English Long Parliament, which had similar religious concerns to the Scots, refused to vote for new taxes to pay for raising an army. Charles therefore started negotiations with Irish Catholic gentry to recruit an Irish army to put down the rebellion in Scotland, in return for the concession of Irish Catholics’ longstanding requests for religious toleration and land security. This army was slowly mobilised at Carrickfergus opposite the Scottish coast but was then disbanded in mid-1641. To the Scots and the English Parliaments, this appeared to confirm that Charles was a tyrant, who wanted to impose Catholicism on his kingdoms, and to govern again without reference to his Parliaments as he had done in 1628–1640. During the early part of 1641, some Scots and Parliamentarians even proposed invading Ireland and subduing organised Catholicism there, to ensure that no royalist Irish Catholic army would land in England or Scotland. Ironically, this in turn, led to the Irish Catholic lords thinking that Charles had used them and then betrayed them. The Stuart kings were, up until recently, Catholic and had turned in order to maintain power. English Protestantism was at an early stage in its development and the (high) Anglican Church differed little from its Catholic counterpart. When the Irish lords rebelled against the Anglican Royalists (loyal to Charles I), the English and Scottish Parliaments refused to raise an army to put down the rebellion unless it was under their command rather than the King’s. Th old maxim of “my enemy’s enemies are my friends did not quite hold true, but the rebellion occupied thousands of loyal troops that would have otherwise gone to England to take part in the first part of the English Civil War – which was not going well for the Puritans. and in the south west, led by Donagh MacCarthy, Viscount Muskerry. In areas where British settlers were concentrated, around Cork, Dublin, Carrickfergus and Derry, they raised their own militia in self-defence and just about managed to hold off the rebel forces. The Catholic gentry near Dublin, known as the “Lords of the Pale”, issued their Remonstrance to the king on St Patrick’s Day 1642 at Trim, Co Meath. On 22 March the Catholic hierarchy met at nearby Kells, Co Meath and almost unanimously agreed that the rebellion was ‘a just war’. Charles I sent a large army to Dublin to subdue them. This “English Army for Ireland” numbered over 20,000 by mid-1642. The Scottish parliament also sent an army to Ulster to defend their compatriots there. In February 1642 the royalist army led by Ormonde based in Dublin advanced to Naas and in March they raised the siege of Drogheda. In April they supplied garrisons in the midlands and won the Battle of Kilrush on their return to Dublin. A quick defeat of the rebels in Ireland was prevented by the outbreak of the English Civil War in mid to late 1642. Among other issues, the English Parliament did not trust Charles with command of the army raised to send to Ireland, fearing that it would afterwards be used against them. At the same time James Tuchet, 3rd Earl of Castlehaven was sent by King Charles to liaise with the Confederates during 1642. Because of the Civil War in England, English troops were withdrawn from Ireland in late 1642 and a military stalemate ensued. After the inconclusive Battle of Edgehill in October 1642, royalists considered that the army sent to Ireland earlier in 1642 would have ended the conflict within days or months, had it been available in England when needed. In 1642, Dublin and its hinterland was surrounded – it was a siege in all but name – Dublin was cut off from the rest of Ireland but still linked to their political masters in England by sea. The massive influx of the 20,000 soldiers in the “English Army for Ireland” caused economic problems for Dublin – they had to be paid and they needed to spend money on essentials – and they needed money to do this and the Dublin merchants needed coins for change. Isolated in Dublin, with his king anxious to minimize his Irish troops, Ormonde therefore agreed to a “cessation” or ceasefire with the Catholics, which began in September 1643. The result was that the greater part of Ireland surrendered to the Catholic Confederation (leaving only districts in the north, the Dublin Pale, round Cork City, and certain small garrisons in the possession of Protestant commanders). This truce was vehemently opposed by the Lords Justices and Irish Protestants in general it as a military capitulation and the beginning of the end of their authority in Ireland. Soon afterwards, in November 1643, by the king’s orders, Ormonde despatched a body of his troops into England to fight on the Royalist side in the Civil War, estimated at 4,000 troops, half of whom were sent from Cork. In November 1643 the king appointed Ormonde as Lord Lieutenant of Ireland — the de facto head of the Irish government executive. There were still significant numbers of the “English Army for Ireland” in Dublin and more coinage was needed to ‘grease the wheels of commerce’ in the city. Under the auspices of the new Lord Lieutenant of Ireland, the next issue of emergency coinage was known as Ormonde Money – it was very different to the previous three issues. This coinage was surprisingly declared legal tender in England and Wales and sometimes examples turn up in Civil War hoards. Generally speaking, siege coins (or, money of necessity) was issued under the authority of local governors. These lightweight coins were not intended to circulate outside the confines of the strongholds or the town under siege. Both Carlisle and Pontefract issues were intentionally produced underweight in order to stretch out a limited supply of plate. Only in Newark was the weight consistently maintained. The Irish ‘Ormonde coinage’ was an exception. One theory is that King Charles I directed Ormonde to negotiate a truce with the Confederate Catholic Assembly in order to free up troops that then could be deployed in England and North Wales. To facilitate this, he, by Royal Proclamation directed in May 1642 that the’ loyal subjects’ in Dublin bring in their plate to be coined to the same standards of weight and purity “as are moneys now current in England”. The King also directed that the Royal Cypher C.R. beneath the crown be displayed the observe and the nominal value on the reverse. This is, perhaps, an indication that both Charles and Ormonde expected these coins to be brought with the troops despatched to England and would need to be accepted there – otherwise these troops might switch sides. Ormonde was now faced with a difficult task in reconciling all the different factions in Ireland. The Old (native) Irish and Catholic Irish of English descent (“Old English”) were represented in Confederate Ireland — essentially an independent Catholic government based in Kilkenny — who wanted to come to terms with King Charles I of England in return for religious toleration and self-government. Meanwhile, the army of the Confederacy also needed coinage. It is thought that the Rebel Money was produced in Kilkenny. On 28 March 1646, Ormonde, on behalf of the king, concluded another treaty with the Confederates which granted religious concessions and removed various grievances. However, the Confederates’ General Assembly in Kilkenny rejected the deal, partly due to the influence of the pope’s ambassador (nuncio) Giovanni Battista Rinuccini, who worked to dissuade the Catholics entering into a compromise. The Confederates called off their truce with Ormonde, and arrested those among their number who had signed the treaty with Ormonde. The Great Rebellion in Ireland continued with Ormonde still in charge – albeit with a diminished confidence and trust amongst his Protestant allies. In 1646, another type of coinage appeared – the so-called Blacksmith coinage – no one knows for certain when they were struck but some sources state 1646 as the likely date. These, large denomination coins – struck in silver and gold – were clearly designed for larger transactions. Were they introduced for officers to buy provisions, or were they introduced for merchants to source provisions, or a mixture of both? 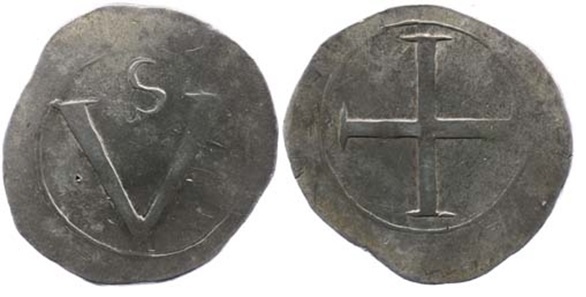 It is now thought that the Blacksmith halfcrowns were struck in Kilkenny by the Confederate Catholics – loyal to the King rather than face the prospect of being ruled by a Puritan parliament (likely to have a very anti-Catholic agenda) from Westminster. However, in declaring for a corrupt and unpopular King, they virtually ensured a sectarian backlash. Both the pistole (4dwt 7gr) and the double pistole (8dwt 14gr) were also known as “weight money” because their design (on both sides) comprised their weight in pennyweights (dwt) and grains (gr). They have also been erroneously described in the early literature and early auction catalogues as ‘Dublin Money’ and ‘Ormonde gold’ – and modern counterfeits date from the 19th C forward – so buyers, please be very careful ! and the second dated the 1st of February 1646. At this time the old style Julian calendar in which the new year began on the 25th of March prevailed, therefore February 1646 is after July 1646, which makes it 1647 by our calendar. In addition to the emergency coinage issued by the Irish loyal to the crown, there were also a series of coins struck by the inhabitants of 4 towns in Munster that held out against the forces of the Confederated Catholics. 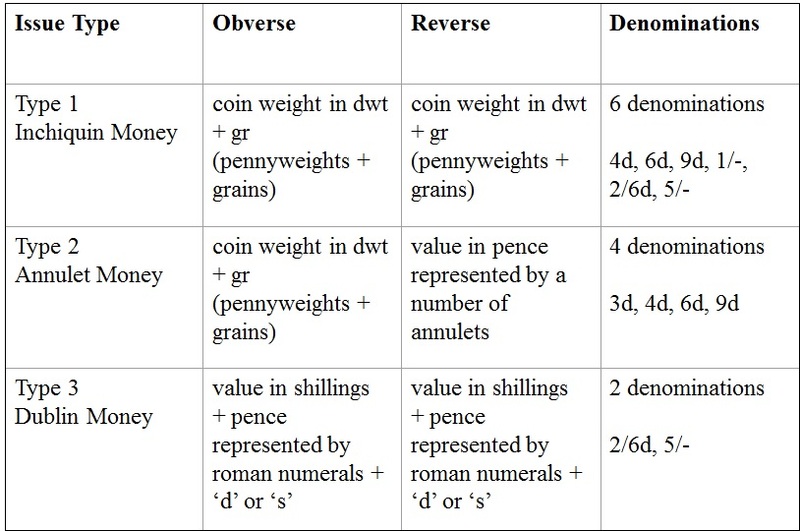 The emergency coinages of Youghal, Bandon, Cork and Kinsale were much cruder than those of Dublin – they struck farthings, halfpennies and twopences in copper, a threepence in pewter and sixpences in silver. 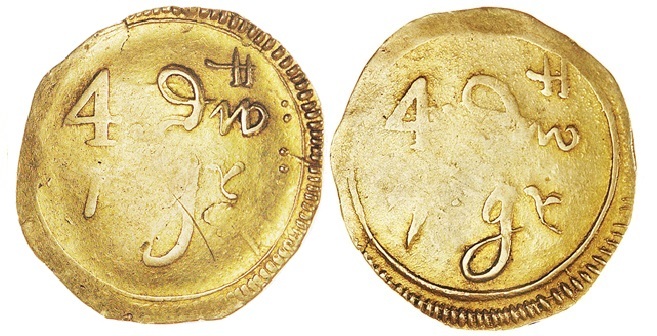 Some large denomination coins of the realm were counter-struck with “Corke”. At the beginning of August 1647, realizing he couldn’t defend Dublin against the rebels, Ormonde handed over Dublin, together with 3.000 royalist troops under his command, to the Parliamentarian commander Michael Jones, who had recently arrived from England with 5,000 Parliamentarian troops. Ormonde in turn sailed for England, remarking of his surrender that he “preferred English rebels to Irish ones. The Irish Confederates were now much more amenable to compromise, as 1647 had seen a series of military disasters for them at the hands of English Parliamentarian forces. On 17 January 1649 Ormonde concluded a peace with the rebels on the basis of the free exercise of their religion. On the execution of the king (30 January 1649) he proclaimed Charles II, who made him a Knight of the Garter in September 1649. Ormonde was placed in command of the Irish Confederates’ armies and also English Royalist troops who were landed in Ireland from France. Ormonde then issued a posthumous silver halfcrown and crown in the name of Charles I – in doing so, he guaranteed an unfavourable response from Cromwell and the English Civil War was now about to be extended to Ireland – with Cromwell himself arriving in Ireland soon after. Once Cromwell joined forces with Jones in Dublin, the end of the Irish Confederacy was inevitable. The Ormonde issues of 1643-44 were followed by a so-called ‘post-mortem’ issue in 1649 (after the death of King Charles I). These are recognisably different insofar as the central design is surrounded by various legends close to the rim. Equally crude in their method of minting, these coins are seldom found in better than Fine grade and often have faults. An alliance was signed in 1649 between the Irish Confederate Catholics and Charles II (the exiled son of the executed Charles I) and the English Royalists. This allowed for Royalist troops to be sent to Ireland and put the Irish Confederate Catholic troops under the command of Royalist officers led by James Butler, Earl of Ormonde. Their aim was to invade England and restore the monarchy there. This was a threat which the new English Commonwealth could not afford to ignore. Even if the Confederates had not allied themselves with the Royalists, it is likely that the English Parliament would have eventually tried to reconquer Ireland. They had sent Parliamentary forces to Ireland throughout the Wars of the Three Kingdoms (most of them under Michael Jones in 1647). They viewed Ireland as part of the territory governed by right by the Kingdom of England and only temporarily out of its control since theIrish Rebellion of 1641. In addition many Parliamentarians wished to punish the Irish for atrocities against English Protestant settlers during the 1641 Uprising. Some Irish towns (notably Wexford and Waterford) had acted as bases from which privateers had attacked English shipping during the 1640s. Parliament had raised loans of £10 million under the Adventurers Act to subdue Ireland since 1640, on the basis that its creditors would be repaid with land confiscated from Irish Catholic rebels. To repay these creditors, it would be necessary to conquer Ireland and confiscate such land. Cromwell and many of his army were Puritans who considered all Roman Catholics to be heretics, and so for them the conquest was partly a crusade. The Irish Confederates had been supplied with arms and money by the Papacy and had welcomed the papal legate Scarampi and later the Papal Nuncio Rinuccini in 1643–49. Ormonde’s posthumous coinage for Charles I may have been a symbol of Royalist Ireland’s intent but there were plenty of reasons for the Cromwellian invasion. The New Model Army met its only serious reverse in Ireland at the siege of Clonmel, where its attacks on the towns walls were repulsed at a cost of up to 2,000 men. Ormonde’s Royalists still held most of Munster, but were outflanked by a mutiny of their own garrison in Cork. The British Protestant troops there had been fighting for the Parliament up to 1648 and resented fighting with the Irish Confederates. Their mutiny handed Cork and most of Munster to Cromwell and they defeated the local Irish garrison at the Battle of Macroom. In May 1650, Charles II repudiated his father’s (Charles I‘s) alliance with the Irish Confederates in preference for an alliance with the Scottish Covenanters (seeTreaty of Breda). This totally undermined Ormonde’s position as head of a Royalist coalition in Ireland. Cromwell published generous surrender terms for Protestant Royalists in Ireland and many of them either capitulated or went over to the Parliamentarian side. This left in the field only the remaining Irish Catholic armies and a few die hard English Royalists. From this point onwards, many Irish Catholics, including their bishops and clergy, questioned why they should accept Ormonde’s leadership when his master, the King, had repudiated his alliance with them. Cromwell left Ireland in May 1650 to fight the Third English Civil War against the new Scottish-Royalist alliance. He passed his command onto Henry Ireton. The Parliamentarians crossed the Shannon into the western province of Connacht in October 1650. An Irish army under Clanricarde had attempted to stop them but this was surprised and routed at the Battle of Meelick Island. Ormonde was discredited by the constant stream of defeats for the Irish and Royalist forces and no longer had the confidence of the men he commanded, particularly the Irish Confederates. He fled for France in December 1650 and was replaced by an Irish nobleman Ulick Burke of Clanricarde as commander. The Irish and Royalist forces were penned into the area west of the river Shannon and placed their last hope on defending the strongly walled cities of Limerick and Galway on Ireland’s west coast. These cities had built extensive modern defences and could not be taken by a straightforward assault, so Ireton besieged Limerick while Charles Coote surrounded Galway, but they were unable to take the strongly fortified cities and instead blockaded them until a combination of hunger and disease forced them to surrender. An Irish force from Kerry attempted to relieve Limerick but this was intercepted and routed at the Battle of Knocknaclashy. Limerick fell in 1651 and Galway the following year. Disease however killed indiscriminately and Ireton, along with thousands of Parliamentarian troops, died of plague outside Limerick in 1651. The above table is a very simplified summary – especially when describing the denominations of the Cities of Refuge, i.e. they are all quite different to one another. Each of these coin types will be described in detail in a future post. All are rarely seen, except for the Ormonde Money of 1643-44 – none are cheap to buy !